"This is the story I'm proudest of." 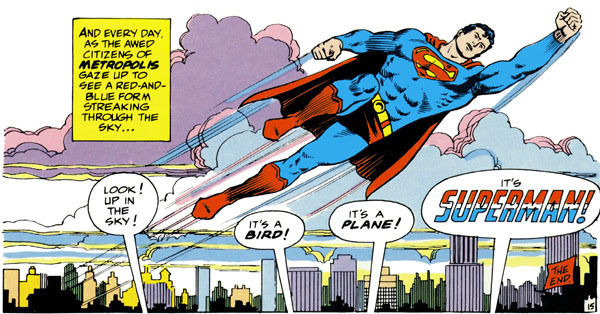 When Superman debuted in 1938, a one-page origin was included. For the first issue of his own magazine, the origin was increased to two pages. The early comic strips had Jor-El and Lara (then called Jor-L and Lora) making their first appearance. But not until the Man of Steel had been running for ten years did he get a complete story devoted to his origin (coming soon to this website). The story was retold and updated from time to time. In 1973, plans were made for a Superman Park in Metropolis, Illinois. A book was produced for the park which included a new origin for Superman - the same origin which you have just read. 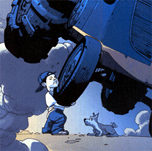 In this version, two deviations were made from the traditional legend: Superbaby's rocket did not explode after he was taken away from it, since the rocket was to be on display in the park; and the Kents were buried in their own back yard, rather than in a cemetery, as that was where the park planners had the grave situated.